Playing The Long Ball continues its countdown to the 2014 FIFA World Cup Brazil by taking an in-depth look at the betting market on the identity of the final referee. 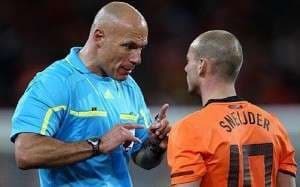 No referee has controlled more than one FIFA World Cup final so the first person whose name one should put through a line is Howard Webb. The English referee issued 14 yellow cards, including two to Netherlands defender John Heitinga, in the 2010 FIFA World Cup South Africa final and it is incredibly unlikely that Webb will receive consecutive appointments. It is remarkable that Webb is trading at odds of 13.00 with BetVictor. There are some zeroes missing off his price. International football is a complex geopolitical game these days and one would be naive to think that betting on the 2014 FIFA World Cup Brazil final referee is as simple as selecting whomever one thinks is the finest official. Not only does one need to be capable of handling the biggest match on Earth but also one needs to be from the correct part of the planet. To think otherwise would be stupid. One thinks that the days of UEFA-affiliated referees getting all the top jobs are gone. European officials controlled each of the first 11 FIFA World Cup final until Arnaldo Cezar Coelho, of Brazil, took charge of the 1982 FIFA World Cup Spain final between Italy and West Germany. European referees have come back into fashion since the turn of the century but the fact that two of the last three FIFA World Cup finals have had a UEFA badge wearer in the middle – Pierluigi Collina in 2002 and Webb in 2010 – must count against several of the officials near the top of the 2014 FIFA World Cup Brazil final whistle blower betting. 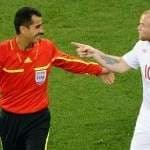 Nine European referees, including Webb, will officiate at the 2014 FIFA World Cup Brazil and all of them are opposable. So, too, are referees associated with CONMEBOL. No home association official has refereed a FIFA World Cup final since UEFA’s Jack Taylor stood in the centre of the 1974 FIFA World Cup West Germany decider between the host nation and the Netherlands. Another five 2014 FIFA World Cup Brazil referees bite the dust if one uses that specific criterion. One has eliminated more than half the 25 officials whom the FIFA Referees Committee has appointed to the 2014 FIFA World Cup Brazil. One is willing to scrub out New Zealand’s Peter O’Leary, who made the cut as the OFC representative. That leaves the 10 officials from the AFC, CAF and CONCACAF regions, all of whom are trading at attractive odds. The AFC is a region that has yet to provide a FIFA World Cup final referee and one is interested in two of the four Asian appointees – Japan’s Yuichi Nishimura and Uzkekistan’s Ravshan Irmatov. BetVictor is offering the long odds of 67.00 about Nishimura and 101.00 about Irmatov. Nishimura officiated in the 2010 FIFA World Cup South Africa where he controlled three matches and operated as the fourth official in the final. Nishimura has been on the FIFA list since 2004 and he has been a regular referee at major international tournaments in the last four years. Irmatov is an alumnus of the 2010 FIFA World Cup South Africa as well. Irmatov took charge of the opening game and ended up refereeing five matches, including the semi-final between the Netherlands and Uruguay. 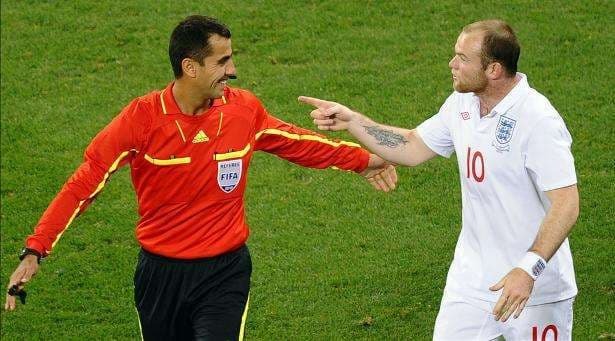 No official has ever refereed more games at a single FIFA World Cup than the five that Irmatov managed four years ago. Irmatov was the AFC Referee of the Year in 2008, 2009, 2010 and 2011, plus he has handled several finals of significant competitions. Nishimura and Irmatov are massively over the odds to referee the 2014 FIFA World Cup Brazil final. At odds of 67.00 and 101.00 one can dutch them and get a price of almost 41.00.